Recently, two new entries have been added to the KFG's Companion to the Study of Secularity. Katja Triplett's entry on Religion and Medicine in Japan provides an historical overview of the development of the relationship between religion and medicine in Japan from the Asuka period (538-710), when Buddhism was officially introduced in Japan, to the 20th century. The Companion to the Study of Secularity is a publication that is projected to grow over time. It consists of short articles in encyclopaedic form and style, which detail the specific concepts and peculiarities of secularity in different regions and eras. The Companion’s entries are not intended to initiate detailed intradisciplinary discussion or to present new findings from research. Instead, they should provide the wider academic community with an insight into the concept of multiple secularities and thus foster transdisciplinary exchange. In our latest Working Paper #8 "Be a civilized citizen!" 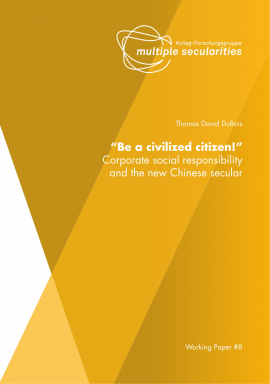 the historian and sinologist Thomas David DuBois analyses "Corporate Social Responsibility" in today's China. In doing so, he aims to leave behind the usual focus on the presence or absence of religion to examine afresh whether an understanding of what we might call the “new Chinese secular” might shed light on some of the country’s key social transformations. Working Paper #7: Modes of Religionization: A Constructivist Approach to Secularity is an extended version of Markus Dreßler's above mentioned entry to the Companion to the Study of Secularity. In his Working Paper he discusses the concepts of religionization, religio-secularization, religio-secularism, and religion-making in more detail and illustrates their heuristic potential by exploring the changes in the concepts of din and millet in late Ottoman-Turkish lexicographic discourse. Ali Mirsepassi's Working Paper #6 on Mistaken Anti-modernity: Fardid After Fardid was originally presented at our conference on Critique of Modernity. Mirsepassi undertakes several lines of enquiry in the history of ideological and political movements centered on the “modernity” polemic at the transnational level, eventually challenging several pervasive “dogmas” of post-colonial theory: that orientalism is a purely modernist intellectual project, while anti-orientalism is by necessity its more “local” discursive counterpart in a dualism of East and West. Joint conference of the Institute for the Study of Religions at Leipzig University and the KFG "Multiple Secularities"
The aim of this international conference is to cast light on the development and critical potentials of the religious and cultural setting that moulded the normality of modern secular lifestyles. The conference focusses on the practical level: What did these secularists actually do? What meant living a secular(ist) life? Furthermore, we evaluate the narratives that were used to legitimize these practices. Our Bulletin gives the opportunity to comment on current political, social or cultural events and developments from the perspective of Multiple Secularities, to place them in a broader context through our expertise or to present alternative perspectives. We would therefore like to encourage you to make short, journalistic style contributions to the Bulletin. Please contact Judith Zimmermann if you wish to do so. 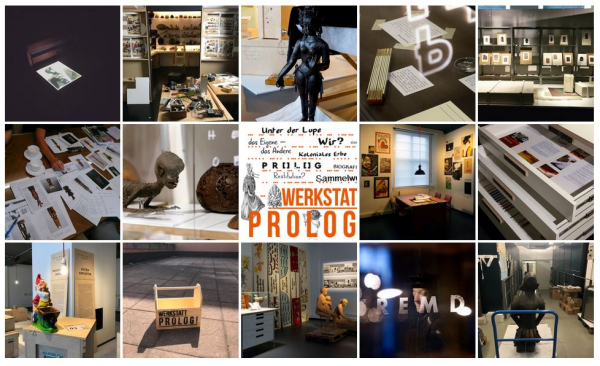 Foteine König wrote a Bulletin entry on her recent visit to Leipzig's Ethnological Museum titled Sacred or profane? Thoughts on objects in ethnological museums. Roopesh OB provides some reflections on the recent political and religious turmoil around a temple in the southern Indian state of Kerala in his article on Women Entry in Sabarimala Temple: State, Judiciary, and Religion. Lena Dreier authored an article on The Political Appeal of "European" Imams about efforts to guide the training of imams politically and thus to cultivate a generation of Imams who naturally represent and defend not only Islam but also fundamental European values.